Six exposure panorama: top 3 were exposed for the sky, bottom 3 for shadow, did a few of the middle shot. I first made a sky pano, then shadow pano, then blended them with manual masking in the middle. Jim, you did a great job of blending them all. I also really love that bit of gutsy orange in the middle that really looks great with the blue sky and actually makes this image sing. I don't think it would be as spectacular without it. Beautiful! Well done, I like it. It's, in addition to the technical execution, also a good demonstration of a successful vertical panorama, by virtue of composition. Many vertical panoramas leave a feeling of missing something at the left or right, but not this one. This one deserves being printed large, like wall-size high from floor to ceiling. I assume that the stitching provided you with plenty of pixels to do that with little compromise. I agree that this is magnificent asa vertical pano and that orange splash really makes it alive. 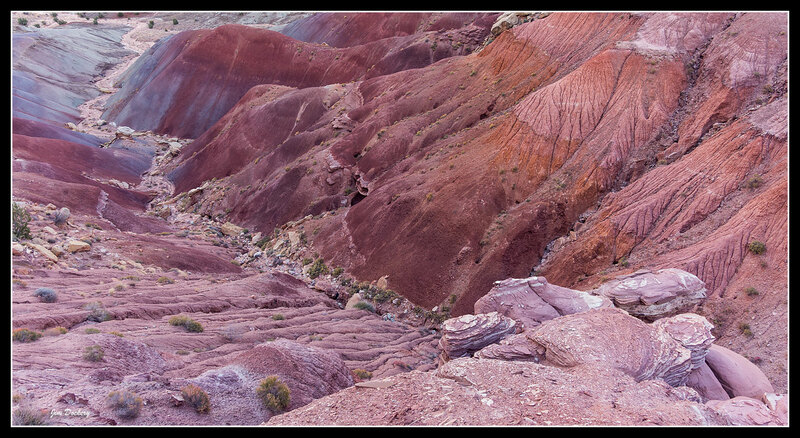 Here is a pano of the bad lands in the lower part of the previous shot. This is splendid! You have captured such a great example of a sculpted river bed and there's lots of detail. In the first, vertical pano, the upper 1/3 of this river bed is very well characterized. This new image completes that impression. There is so much work you have done. Reminds me of the challenge of imaging giant multileveled waterfalls - one get get lost in this world for days as there are so many great ways of presenting the wealth of detail, texture, drama and beauty. Asher, it bugged the hell out of me blasting past this viewpoint early in the morning a week before when heading to a long hike with friends. I returned later for a car hike with my wife with photography as the goal and had plenty of time to shoot. I highly recommend this nice paved (up to this viewpoint) road to any photog heading down to The Escalante region. I'd love to get to the place some time...and bring with a model, perhaps. Alain Briot style ?... inspiration ? We hardly ever get to see vertical panoramas. Nice to see. They commonly get criticized for some reason, but I remember one pro commercial photographer in the 70's or 80's who loved and recommended vertical panoramas. Even back then, few photographers made them but he created and printed large verticals from his panorama camera as a way to break that tradition.